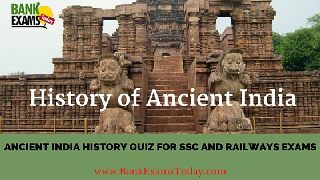 Today we are presenting you a 10 question set on Ancient India History which is very important for your upcoming SSC CGL 2016 and RRB NTPC 2016. Try to solve it. 1. The religious movements of Buddhism and Jainism were led by _____________. 2. Mudra Rakshasa was written by ____________. 3. The capital of the king Kharavela of Kalinga was ______________. 5. The Buddha attained nirvana at ______________. 6. Kautilya hailed from ______________. 7. Alexander was the son of Philip II of _____________. 8. Kanishka was the follower of _____________. 9. Vardhamana Mahavira died at ______________. 10. Pushyamitra Sunga was a staunch of ___________.